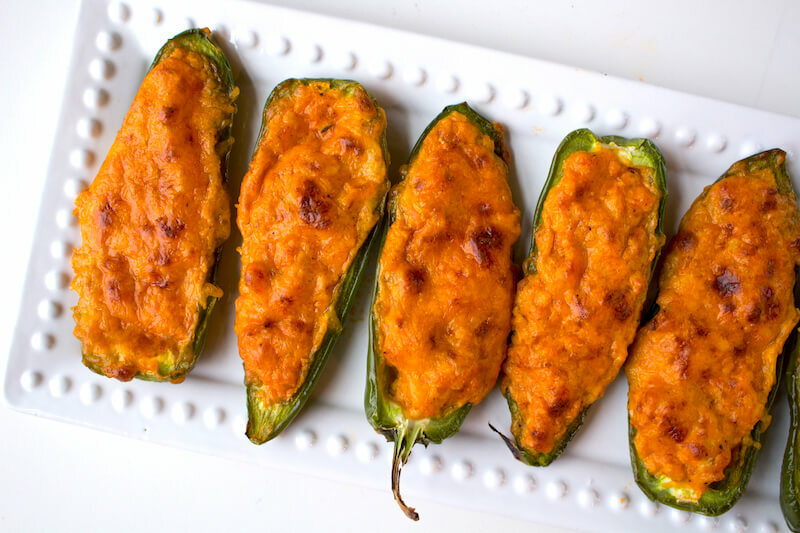 Give your favorite cheesy jalapeño popper recipe a twist by jazzing it up with chicken and enchilada sauce. Each popper is packed with flavor and just the right balance of heat. 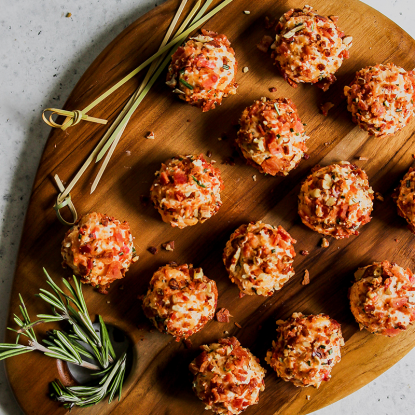 They’re sure to become your new favorite party appetizer! Start by slicing jalapeños in half lengthwise and then removing the seeds and membrane. Be careful not to touch the seeds as oils are hot and will burn should you touch your eyes. Lay each half on a foil-lined baking sheet. 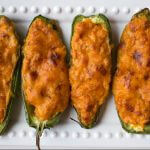 Combine softened cream cheese, cooked chicken, enchilada sauce and cheddar cheese the fill each jalapeño half with the mixture. Next, top with additional cheddar cheese and bake for 18 minutes. Finish under the broiler on HIGH for an additional 1 to 2 minutes until the cheese is melted and golden brown. Shred leftover chicken breasts and store in an airtight container until you’re ready to make these poppers. Use canned chicken for an easy and quick protein option. 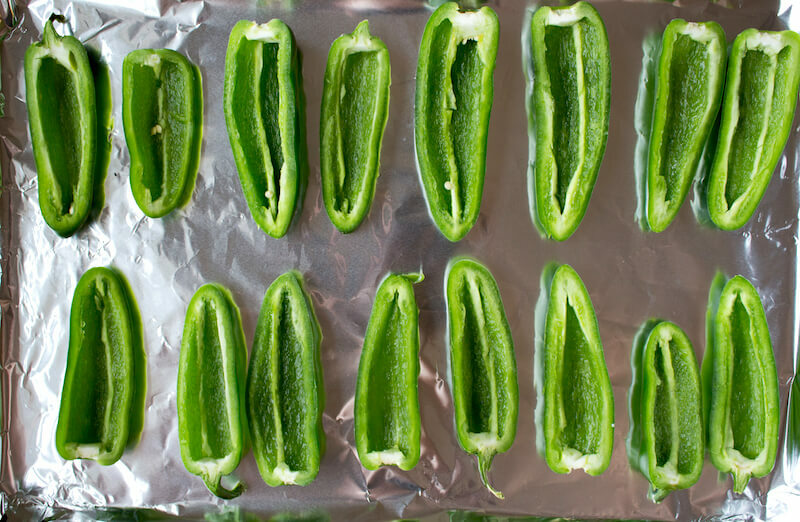 Prepare the poppers through filling the jalapeños and then cover and store in the refrigerator for up to 24 hours. When you’re ready to serve, sprinkle with cheddar cheese and bake. Serve immediately for the best results. Add a sprinkle of chopped cilantro and a side of sour cream for even more flavor. 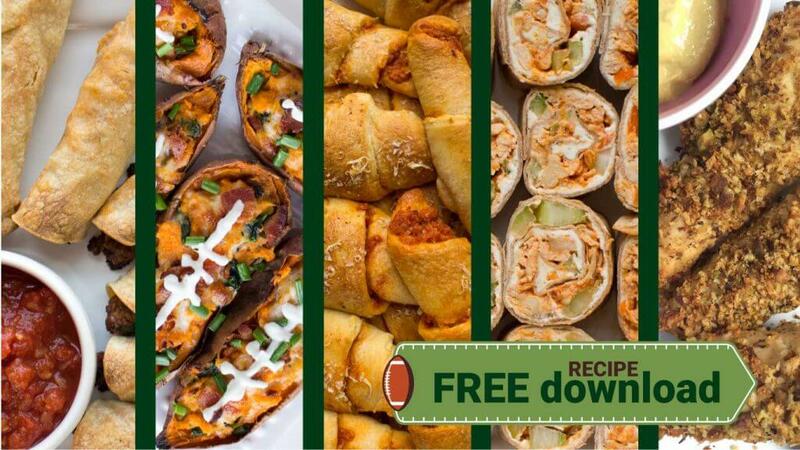 Get more tailgating recipes by checking out my Ultimate Tailgating Guide! You’ll find dozens of recipes plus a free downloadable. Heat a large skillet over medium heat. Add olive oil and saute onions for 5 minutes or until soft and translucent. Add ground chicken, salt and pepper and cook until chicken crumbles and is no longer pink (about 5-7 minutes). While chicken cooks, add cream cheese to a medium-sized bowl and soften in the microwave for about 10-20 seconds. 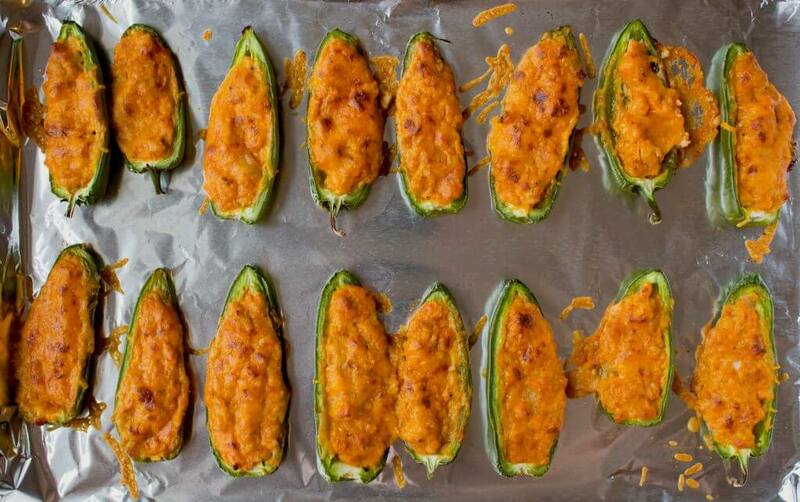 Add enchilada sauce, ½ cup cheddar cheese, cumin, paprika, and garlic powder to cream cheese and mix until combined. Gently mix in cooked ground chicken. 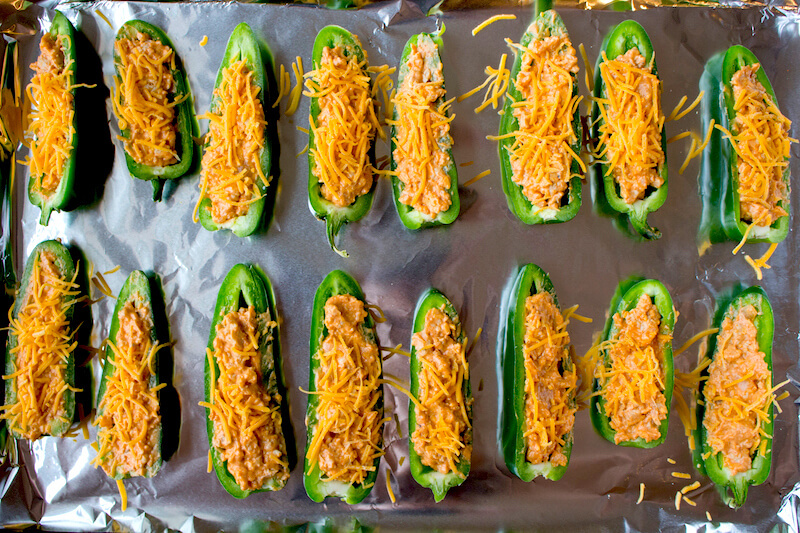 Line a baking sheet with foil and arrange jalapeños on the sheet, cut side up. Fill each jalapeño half evenly with the enchilada mixture and spread to the edge. Sprinkle evenly with remaining cheddar cheese. Bake filled jalapeño at 375 degrees F for 18 minutes, then broil on high for 2 minutes until tops start to brown. Serve immediately.